So you would like to start a blog? 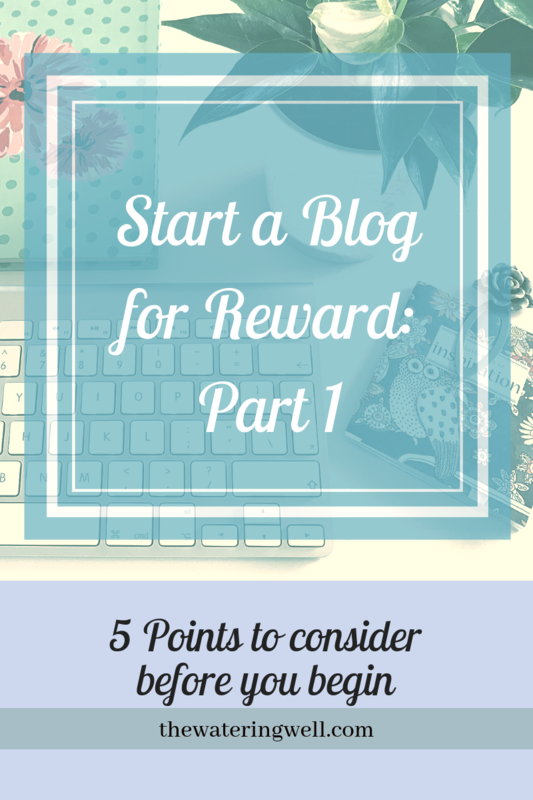 Welcome to the first of 3 posts in the series “Start a Blog for Reward”. Does the idea of a blog interest you but you have no idea what it entails? Since I started The Wateringwell, I have been asked two questions countless times. Firstly, how do you get started? Secondly, can you make money from a blog? I try and explain in the simplest way possible without losing the person but usually, I lose them anyway. Hence I decided to write a series of blog posts to explain the basics so that anybody can get started. I am not going into all the nitty-gritty details as this is not the focus of The Wateringwell, but you will learn enough to get started and I will point you in the direction of some of the best talent on the internet to teach you the rest. When I set out to start a blog with the intention of providing a platform for my book, I had no idea what I was doing. I started from scratch and because it was so overwhelming, I procrastinated until eventually, it took 3 years to get my blog off the ground. It needn’t be that way and if I can do it, anybody can. Yes it does take work, but perseverance pays off and the more you get the hang of it, the easier it becomes. On the other hand, I am also skeptical about the claims that one can set up a blog in a few minutes. You may be able to set up a blog in a few hours but you will end up cursing in the long run when you have to go back and revisit parts of it. The biggest mistake people make with blogging is to think it is easy and then rush headlong into it. Take time to plan your blog upfront and it will save you time and money later. That being said, you will most likely not get it all right in the beginning, but that is ok.
One of the aims of The Wateringwell is to help women who are facing challenges in various areas of their lives, financial being one of them. Blogging can be a lucrative second income and if you work at it, a profitable main stream of income too. My blog has come to mean so much more to me than I ever anticipated and I can highly recommend you at least give it a go. I only wish I had this opportunity 15 years ago when I was a struggling single mom. 1. Is blogging for me? The first question you need to ask yourself is whether blogging is right for you. Don’t be fooled into thinking it is an easy way of making a passive income. Yes, you are your own boss, can work flexi-time from home and write about something you enjoy. 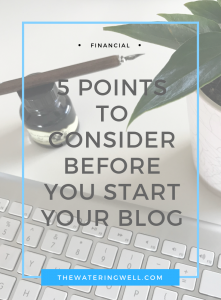 But the truth is, that many blogs fail and as few as 5% are profitable, which I believe is because people are unprepared beforehand and disillusioned because it doesn’t happen overnight. So be realistic in your expectations and take a little time to do things properly. Do you have something worth sharing? Ideally, you should already have something worthwhile to share. Having said that, there is a market for virtually anything but you will need to know enough about the topic to post regularly. We discuss finding a topic further on, but the point is before you start your blog, you have to know what you are going to talk about. Are you prepared to give your blog priority? If you want to be successful, you have to treat your blog as a business. Be willing to invest in your business and learn new skills. There is loads of free information online but sometimes it pays to go with the experts. A successful blog takes commitment. Are you prepared to make that sacrifice and commitment? Do you have enough spare time? Consistency is key so be prepared to set aside a reasonable amount of time to focus on your blog, especially while you are still making a name for yourself. Do you have time available to set aside, preferably daily, to work on your blog? A blog requires a fair amount of writing which means you need to have a good command of the language you are writing in. If writing is not your thing, you may want to consider Instagramming or Vlogging as an option instead. While there is no specific blogger profile, blogging is tough (but not impossible) for introverts. You are required to be vulnerable and personal on your blog in order to build a relationship of trust with your followers and this can be a challenge for some of us. Are you prepared to be more open and sociable online? At times you may feel alone and incompetent, confidence and a belief in yourself are crucial to keep you going through those challenging times. There is usually somebody available to assist with the creative aspects but a little creative vision of your own is helpful when designing your blog and posts. Finally, good planning and organizational skills are essential. A successful blog takes time and an intentional strategy to build a following which requires effort. You may want to start a blog but don’t have a topic yet. If you already have a sure-fire subject, then you can skip to the next point. If not, stop and think about it. Your topic determines your audience, your theme, your branding and many other things too which are all necessary for a blog that stands out. Here are the 3 main points to consider if you are still thinking of a blog topic. Make a list of everything you enjoy. Think back to when you were small, at school and more recently. What gets you excited, what has been a lasting interest? It can’t be something you think looks like fun, you need to have pursued it yourself so you know you enjoy doing it. What are you naturally good at? What training, qualifications or experience do you have? Do people compliment you on your ability in certain areas? Write down everything that comes to mind. These topics are obviously more competitive because so many people are vying for a share of voice, but you can still be successful if you work strategically. Where your passion and the markets need meet is your sweet spot. 3. Who will your audience be? What do you hope to accomplish with your blog? If you want a successful blog it must provide a clear purpose. Once you determined the purpose, picture who your ideal audience is. Who are you targeting? This is very important as it determines your marketing strategy too. I started with the idea that I wanted to encourage women who were struggling with something. Well, that’s half the global population. I soon realized I was shooting wildly, trying to please everybody, and missing my target by miles. Since then I have honed in on specific life struggles for women in a certain age group and it has made my life a whole lot simpler. When you have a good idea of what your blog is about, you can think of a name. The aim is to choose something relevant, simple to read and preferably describes what you do. Give it some thought and leave it for a few days to see if it feels comfortable and sits well with you. 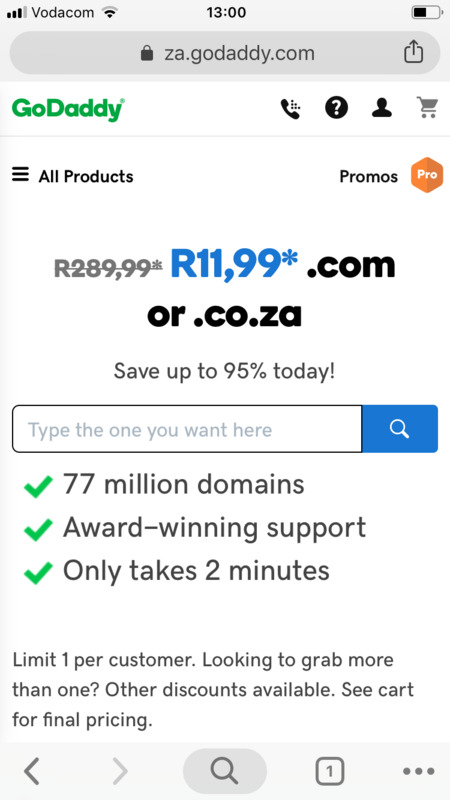 When you have a few ideas, go to www.namevine.com, www.godaddy.com or www.whois.com and type your desired domain name into the search bar. (See image) Namevine is pretty awesome because it tells you if your name is available across all platforms and social media. With all of them you can find out straight away if the name is available. If it is already taken, you can try different options until you find one that you want that is available. In your search, you will be given various options. The most popular is .com but it depends on what you want to do with your blog. 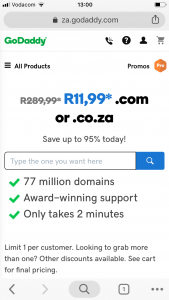 For example .org will be for non-profits or if you are going to stick within your own country you can use the extension for that country only which is generally cheaper. This is an expense you cannot avoid and the price will depend on the popularity of the name and where you buy it from. Once you have an idea of what you want to do, consider a theme that will go well with your topic and audience. Do you want it to be fun and vibey? Artistic? Vintage? Simple? Remember your blog must be an extension of yourself so you want to be authentic. Branding and colors are a key component to the overall look of your blog and should tie in with the overall look and theme. What colors will you use? Pinterest has some excellent ideas for choosing a color. For example, I chose blue because it supports the theme of peace and tranquility I wanted to create. Now is a good time to consider the design of your logo as the style and colors will often flow through your blog. Depending on how complicated your design is, it may take a few weeks to have a logo designed for you so factor that into your time frame. Take some time designing your blog so that you can get it right the first time. Look at some other blogs and websites in a similar niche for inspiration. Take at a look at our The Wateringwell Pinterest Board for further ideas on how to choose a name and color palette for your blog. There are plenty of activities for you to do this week so have fun dreaming up and planning your blog. 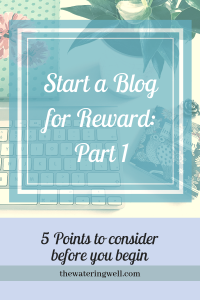 Once you think you are ready to take the next step, you can move onto Start a Blog for Reward: Part 2 on how to set up your blog.